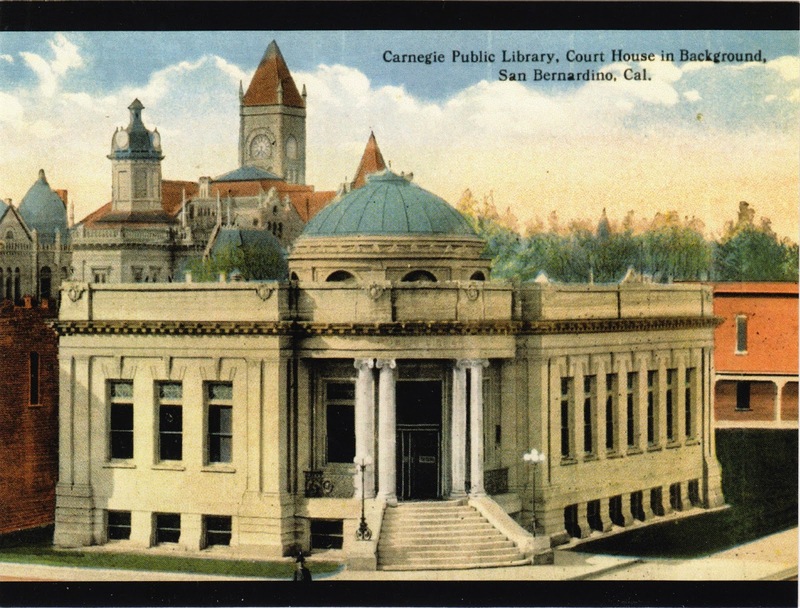 Postcard US-2698983 to Wisconsin, US shows Carnegie Public Library in San Bernardino, California, with the Courthouse in the background. Efforts to establish a public library had continued intermittently since San Bernardino was incorporated in 1869. Carnegie offered a $20,000 grant in 1902. An architectural competition was held where plans submitted by architects were displayed; and citizens voted for their favorite plans. Architects Burnham and Bliesner won the competition with a classical Revival style building plan. The library was opened on August 10, 1904. In 1920, the Carnegie Corporation provided an additional $7,600 grant with the city issuing a $10,000 bond as the matching fund. The library was closed in 1957 as the building was declared unsafe; it was demolished next year. A new library was completed in 1960. The postcard, a reproduction of a vintage postcard c. 1915, was purchased at Zazzle.